Collagen is the major substance that connects skin cells together, which make the skin firm and elastic .Combination of innovative extracts are selected that fully penetrates deep into the layer of skin, to enrich the skin lipid layer, and maintain a moisture regulating system. This artistic combination provides you with protection while replenishing lost moisture. Healthy, younger looking skin is revealed. A luxurious collagen enriched night cream helps to replenish, firm, tone, moisturize and re-Texturiser the skin by reducing fine lines and wrinkles. Suitable for all skin types, this night Creme enhances skin repair and cellular reconstruction by providing intense nourishment to the skin. UN-WRINKLE DAY & NIGHT INTENSE CARE KIT is clinically proven to fade the appearance of sun spots and age spots. It has been specially formulated to free skin of dullness, dark spots, and wrinkles while protecting skin from future environmental damage from the first application. Formulated without Petroleum?s & dyes. Micro Biologically & Analytically tested. Explore the entire range of Combos @ Nykaa available on Nykaa. 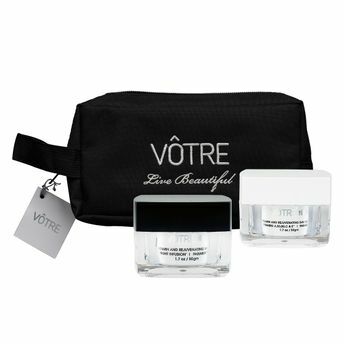 Shop more Votre products here.You can browse through the complete world of Votre Combos @ Nykaa .